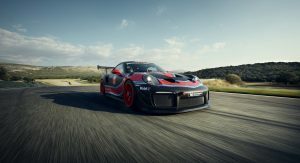 Celebrating its world premiere at the 2018 LA Auto Show is Porsche’s spectacular 911 GT2 RS Clubsport, powered by a 3.8-liter flat six twin turbocharged engine, producing 690 HP (700 PS). 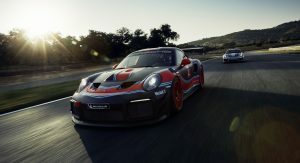 Technically, this is the racing version of the road-legal 911 GT2 RS (991.2), and if you want that gigantic rear wing hanging off the back of your Porsche, you’re going to have to make sure to purchase one of the first 200 units, because that’s all they’re making. “For the upcoming years, our customers will not only race the GT2 RS Clubsport on track days but also at international motor racing events. We are currently holding very productive talks with the race organizer SRO,” stated Porsche VP of motorsport and GT cars, Dr Frank-Steffen Walliser. 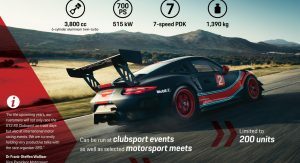 Power for the GT2 RS Clubsport goes through a rigidly mounted seven-speed dual clutch gearbox (PDK), eventually reaching the 310 mm (12.2 inches) wide rear wheels. 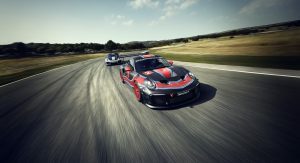 According to the German automaker, traction and braking performance is aided by the positioning of the engine (behind the rear axle), as well as by the six-piston aluminum monobloc racing calipers up front. 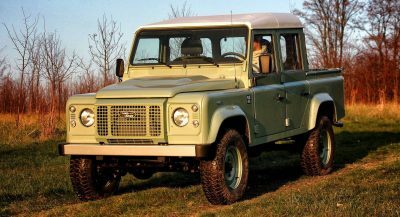 The front axle boasts 390 mm (15.3 inch) diameter brake discs, while the rear has 380 mm (14.9 inch) ones. Weighing in at just 1,390 kg (3,064 lbs), the Clubsport comes equipped with PSM (Porsche Stability Management), traction control and anti-lock brakes. 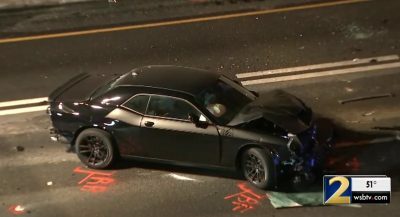 The driver can of course adjust these assistance systems separately, or switch them off completely via a switch positioned on the center console. 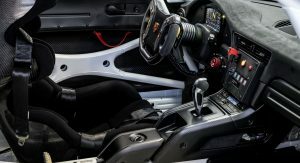 Other easy to spot interior features include the removable carbon steering wheel and color display (taken from the 2019 Porsche 911 GT3 R), as well as the massive safety cage, Recaro racing bucket seat and six-point safety harness. You also get air conditioning. In order to keep the weight down, Porsche had to employ solutions such as the CFRP roof with removable escape hatch, lightweight CFRP hood with quick release, removable CFRP rear hood with quick release, 115-liter FT3 safety fuel cell (refueling through front hood) and the previously-mentioned massive rear wing, which is also CFRP (Carbon Fiber Reinforced Polymer). 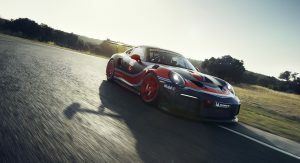 As for the electrical system, there’s a Cosworth ICD with integrated data logger for the instrument cluster, a sport Chrono watch and boost gauge in a vintage finish, Porsche Track Precision Race App, Integrated Lap Trigger, a lightweight and leakproof 60Ah lithium-ion battery in the passenger footwell, an emergency cut-off switch and tire pressure monitoring. A couple weeks back I checked on the service costs for Porsche, McLaren and the like. Porsche is not unrealistic, but when you go to these other manufacturers it is extraordinary. Thousands for an oil change. I owned a couple of new Porsches and was actually impressed by what Porsches cost to service. But then Porsches are driven on a daily basis and they have to appeal to the regular driver. That being said, the GT2RS will need a new engine after a very few races. Buyer beware. The $300,000 is only the beginning. how did your wife Bosxter drive? Bosxter? is that a China only model? What are you talking about? How is this relevant to this post? Is pointing out your inadequacy in writing English and spelling Porsche model names privileged? You need to grow up little boy. Don’t mind him, he’s trying to rediscover his talent for trolling. He’ll get there eventually. 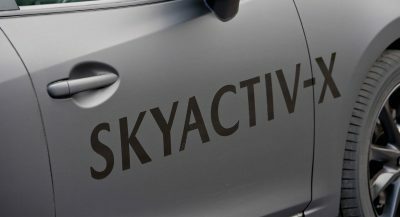 What happens to the engine? Martini livery makes anything better.